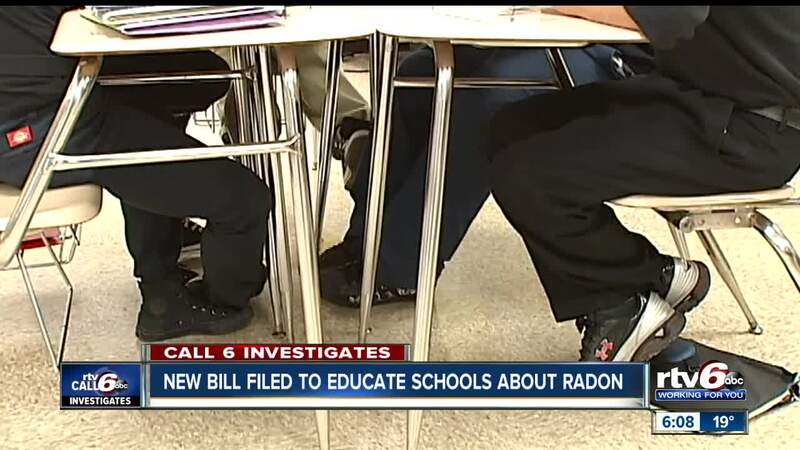 INDIANAPOLIS— A Call 6 investigation into radon in your child’s classroom has prompted another piece of legislation that would educate schools about testing for the cancer-causing gas. Sen. Eric Bassler, R-Washington, filed Senate Bill 632 that would require the Indiana State Department of Health to distribute a best practices manual to schools for radon testing. Radon is the number one cause of lung cancer among non-smokers, killing an estimated 22,000 people every year. Bassler’s bill would require ISDH to hand out radon testing information to the superintendent and facilities manager of each school corporation. Charter and private schools would also receive the radon testing recommendations. The federal EPA recommends schools test for radon at least once every five years, but Call 6 Investigates found 96 percent of Indiana schools haven’t tested in the last decade. “The bill would hopefully, I believe, promote more awareness about radon among the local school corporations and give the information needed to check every five years, do they want to do it at all, every three years,” Bassler said. Most people do not realize they’ve been exposed to radon until they’re diagnosed with lung cancer later in life. Bassler said he is concerned about the health risk to students, as well as the teachers and staff. If passed into law, the Indiana State Department of Health would be required to revise and distribute the manual to each school every three years. Bassler’s bill has been assigned to the Committee on Health and Provider Services, and is expected to get a hearing sometime in February. Two other state lawmakers have filed separate bills aimed at testing schools for radon. Sen. Eddie Melton, D-Gary, has proposed Senate Bill 522, which would require public and nonpublic schools to test for radon by July 2020 and at least once every five years after that. Rep. Carey Hamilton, D-Indianapolis, also filed legislation, House Bill 1292, that would require the Indiana State Department of Health to establish a program for testing and reducing radon gas in school buildings.